SPACES FOR CHANGE[S4C] has conducted a pilot survey on January 30 and 31, 2017, to understand how low-income women living in the Lagos slums use and access energy for cooking and for other domestic purposes. The pilot survey was implemented under the auspices of the multi-year gender and energy reform collaborative research between S4C and the International Institute for Sustainable Development (IISD). The research seeks to identify and establish the linkages between household choice of cooking fuels and kerosene pricing reforms, and use the evidence generated to inform subsidy reform policies, and influence interventions designed to address the health, socioeconomic and environmental impacts of the reforms in the energy sector. 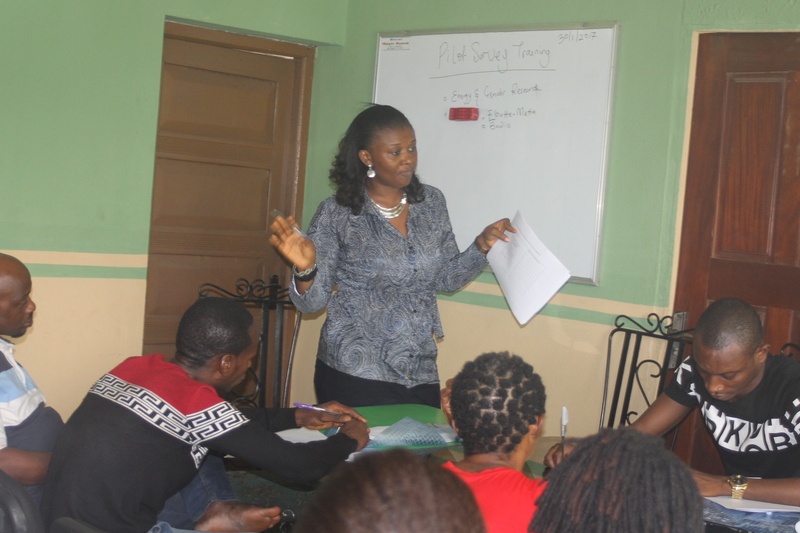 The pilot survey kicked off on January 30, with a specialized training for 11 field enumerators from Badia-East and Ebutte-Metta communities in Lagos, and 4 supervisors. The enumerators comprise of local youth (undergraduates and fresh graduates) from the two target communities. The training, divided into two sessions, provided an opportunity to improve the efficiency of the main survey scheduled for April 2017, while also helping the organization smooth out potentially difficult research questions and other logistical issues. Going through the questionnaires during the first session revealed some structural issues that may need to be adjusted. An example is the length of the questionnaire which was generally considered to be too long, necessitating the review or reframing of certain questions in order to elicit more accurate responses. During the second session, enumerators were divided into two groups: interviewers and interviewees. The interviewers administered the questions on the interviewees, using both English and Yoruba languages. It was a mock-rehearsal of the next day’s questionnaire administration on the field. Through this activity, the enumerators understood how to administer the questionnaires, elicit useful responses, apply the tools and techniques of research delivery. The next day, January 31, 2017, the administration of questionnaires on the field started at 12noon, with 12 enumerators and 4 staff supervisors in attendance. The 12 enumerators were divided into two equal groups, with each half assigned to Badia and Ebutte-Metta respectively. The exercise ended at 4 .00 p.m. and 58 questionnaires were administered and collated. Apart from the frequent complaints about economic hardship resulting from rising food and energy prices, the respondents were generally cooperative. Respondents comprised of young, middle-aged and older women, engaged in petty-trading on the streets or doing small businesses in and around their homes. By presenting the pilot survey to a smaller group, SPACES FOR CHANGE gathered some useful information to guide the future survey. 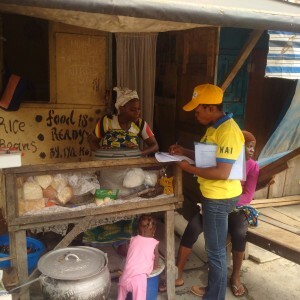 For instance, enumerators administered an average of 6 questionnaires within the assigned period. Based on this, we can fairly estimate that it’d take an average of 45 minutes to complete each questionnaire. With this finding, plus the feedback from respondents, S4C reconfirmed the need to reduce the length of the questionnaire prior to conducting the survey on a larger scale. It was interesting to find that firewood use was not popular in the two communities, but kerosene dependency is quite high. Another interesting finding relates to how residents of slums communities are coping with rising energy prices, by combining different energy sources, and reducing expenditures on other critical household needs such as food and leisure. These are important issues that the main survey will interrogate more extensively.